The Fat Loss Factor is a 12-week online weight loss program created by Dr. Charles Michael Allen and his wife Lori Allen. It involves a comprehensive diet and exercise regime in combination with supportive activities such as goal-setting and stress management. This depends on how much weight dieters want to lose and how fast they want to lose it. Fat Loss Factor is divided into 2 distinct stages. The diet commences with what the authors regard as the most important step in the program; two weeks of natural food. The purposes of the first two weeks are to help you to…. During these two weeks you will consume organic fruit, organic vegetables, raw nuts, raw seeds, legumes, coconut and olive oils and drink only spring or reverse osmosis water. Foods to be avoided include meat, dairy products, eggs, bread, grains, sugar and artificial sweeteners. During the first two weeks of Fat Loss Factor you don’t have to do any strenuous exercise and instead you are advised to walk for 30 to 60 minutes a day, preferably outdoors. Fat Loss Factor Dieters who choose to do the rapid and extreme weight loss options also incorporate at least three days on the lemonade diet, which is also known as the Master Cleanse. This involves fasting on a drink containing fresh lemon juice, maple syrup and cayenne pepper. Eat most of their calories early in the day. Eat something raw at every meal. Have a cheat day once a week. If you have not reached your goal at the end of the twelve week Fat Loss Factor program you are encouraged to evaluate your progress, learn from your experiences and start at the beginning again. Fresh fruits and vegetables, whole grains, legumes, nuts, seeds, organic and low-fat dairy products, organic grass-fed meat, organic free range poultry, salmon, tuna, organic free range eggs, olive oil, coconut oil, flaxseed oil, butter, maple syrup, honey, stevia, whey protein, hemp protein, herb tea. According to the Fat Loss Factor Plan, exercise is highlighted as an important element of a weight loss plan because it boosts metabolism, builds and tones muscles, reduces stress and improves self-esteem. Three separate 12-week strength-training regimes for beginners, intermediate and advanced exercisers. The workouts take between 35-60 minutes and you will start with exercising three times a week. The exercises are mostly performed on machines and video animations of all of the exercises are provided. Also included in Fat Loss Factor are examples of short 15-minute workouts that you can do when you are short on time. After twelve weeks you can add cardio exercise to your routine to boost weight loss with high intensity interval training being recommended for rapid results. Yoga, Tai Chi and Pilates are also recommended as a method to reduce stress. The Fat Loss Factor is available online for $47. Dieters have a choice of four diet options depending on their goals. 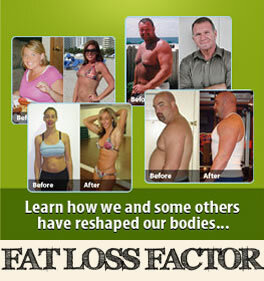 The Fat Loss Factor exercise program is customized to the individual’s current level of fitness. Encourages the intake of organic foods and fresh fruit and vegetables. Encourages goal setting and keeping a journal, which is associated with greater weight loss success. The Fat Loss Factor diet includes recipes and a grocery list. Provides advice about creating a weight-management lifestyle. May be more expensive to eat organic foods. May require more time to be spent on meal preparation and planning. Advanced options in Fat Loss Factor require at least three days of fasting. Requires gym membership or home gym equipment in order to perform the recommended exercise regime. The Fat Loss Factor Diet is a comprehensive weight loss program that can be customized to suit a range of goals and fitness levels. It provides dieters with a detailed plan as well as instruction and education regarding how to lose weight as well as create a healthy lifestyle. particular day to get optimal results.